Rainbow Six Siege’s big balance patch for Year 4 Season 1 is out today. Ubisoft has confirmed that patch Y4S1.3 launches today on PC, and tomorrow on PS4, and Xbox One. Mid-season patches like that typically focus on balance tweaks, and today’s update sure does have plenty of them. As revealed in last week’s Designer’s Notes blog post, the bigger changes include the long-awaited Lion rework, a nerf to Capitao, Nomad, and a surprise nerf to Maestro. Specific launche times have not yet been revealed, but we’ve included the final set of notes below. The long awaited Lion rework is around the corner, and he’s certainly been nerfed. Ubisoft wants players to use his ability tactically without scarifying its great utility to gather intel. To do this, the developer is reducing the time enemies will be highlighted, and the duration of the scan. Further, enemies will now appear as red pings (similar to Alibi’s ability) rather than what was essentially a wallhack. To compensate, Lion will now have three charges instead of two, with cooldown for each reduced to 15 from 27 seconds. Reduced the ability warning from three to one-and-a-half seconds. Reduced the scanning from four to two seconds. Reduced the ability cool-down from 27 to 15 seconds. Increased the number of charges from two to three. Capitao’s asphyxiating bolts are getting a damage reduction, but an increase to the size of their area of effect. Ubisoft wants to shift Capitao to his intended role of area denial now that improvements have been made to the propagation system to prevent it from going through objects. Reducing damage per tick from 19 to 12. Size of the area of effect increased. The area takes two seconds to reach its maximum size. Nomad is perhaps the patch’s biggest surprise nerf. Her Airjabs will now produce an idle sound to warn players, and her claymore is being replaced with stun grenades to lessen her effect as a roamer/flanker counter. Ying’s Candelas will now function similarly to grenades; the longer they’re cooked, the sooner they’ll explode. This was done to reduce spam, and to make using them more intuitive. Kaid now carries less shotgun ammo, but his AUG-A3 got a damage buff. Maestro is the recipient of another surprise nerf. His Evil Eye cameras will now drop the bulletproof window when hit by EMPs and shock drones, making it possible to destroy them without having to wait for Maestro to start firing. Blitz has been hit hard with a nerf to his shield flash cooldown to make going against him less frustrating without impeding his ability to rush objectives. IQ’s gadget now also detects Echo when he’s on his PDA, for consistency. Fixed – When ember lethal bolt is shot directly on a wall, fire FX is not occluded and damage is still dealt on the other side of the wall. Fixed – Kriss 308 damage curve dropoff. Damage curve now properly adheres to damage curve stated in UI. Fixed – Defenders can sometimes be pinged a 4th time at the end of Lion’s debuff effect, after the 3 regular pings if there is network latency. Fixed – Sometimes defenders affected by Lion’s scan can see a 4th red triangle appearing in the debuff icon after the scan if there is network latency. 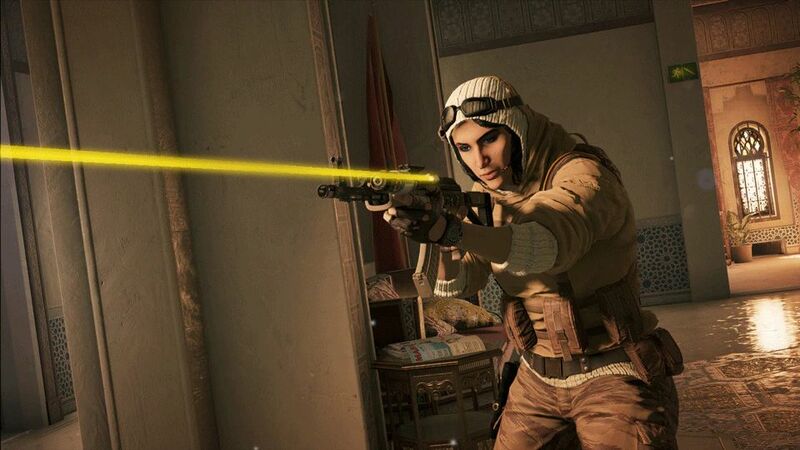 Fixed – Nomad’s detonation VO line does not play or plays too late when someone is caught in her Airjab. Fixed – Ying’s Candela SFX and UI crosshair indicators are not synchronized with the Candela lights while charging. Fixed – Ying’s Candela placement in her hand while crouching is off when viewed from 3rd person POV. Fixed – Sound propagation issues through destroyed walls. Fixed – Pressing the Home button in a custom online match on PC/XBOX while using a controller kicks the player out of their own lobby. Fixed – Squads are forced out in custom online lobbies when one member leaves. Fixed – Inviting a squad member already in a custom lobby forces players out of the lobby and breaks invites from leader. Fixed – Players can clip through the walls of the brown sheds of Outback. Fixed – Gridlock Trax Stingers can deploy inside the indestructible floor at 3F Bedroom Hallway. Fixed – During the planning phase there is no way to pick up the defuser and no related UI elements are present on the Ready screen. Fixed – Defusers can be thrown in the shelf of 1F Garage of Outback, and operators can clip through the shelf as well. Fixed – Defuser cannot be retrieved after being dropped out of bounds behind a caravan in EXT Camping in Outback. Fixed – Defenders can reach Convenience Store Roof on Outback after vaulting a rail. Fixed – Players have a LoS towards Back Entrance by vaulting onto a vending machine in Outback. Fixed – Player have a LoS towards Fuel Pumps by vaulting onto a freezer in Outback. Fixed – Erroneous vault prompt at EXT Fuel Pumps. Fixed – Operators clip through metal railing when rappelling at EXT Motel Balcony in Outback. Fixed – Operators can enter a washing machine while rappelling on EXT Motel Balcony in Outback. Fixed – Operators clip through destructible walls in 2F Games Room and 2F Dorms of Outback. Fixed – LOD issues in 2F Office of Outback. Fixed – Operators can break collision with shelf in 1F Garage in Outback. Fixed – Minor visual texture and clipping bugs. Fixed – Players can vault onto catwalk area in 1F Garage of Clubhouse. Fixed – Attackers can go on top of the purple tarps on Coastline. Fixed – Various rocks outside Chalet do not have matching collision boxes. (fixed for some spots). Fixed – Loss of focus after selecting equip to all in shop menu can’t be regained with keyboard. Fixed – R6 Extreme Fan and Pro League Chibi ’19 thumbnails have placeholder present. Fixed – The Golden Wattle Charm is missing from title. Fixed – Jäger’s birthday skin operator icon is rotated compared to the normal icon. Fixed – Sledge’s birthday skin operator icon is inverted compared to the normal icon. Fixed – Minor visual texture/modeling issues for Ash’s FBI uniform, Sledge’s First War Headgear, Mute’s Clone and Union Jack headgears.